"Gulmohar" redirects here. For other uses, see Gulmohar (disambiguation). Delonix regia is a species of flowering plant in the bean family Fabaceae, subfamily Caesalpinioideae. It is noted for its fern-like leaves and flamboyant display of flowers. 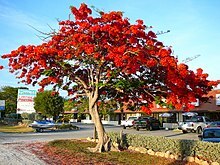 In many tropical parts of the world it is grown as an ornamental tree and in English it is given the name royal poinciana, flamboyant, flame of the forest, or "flame tree" (one of several species given this name). This species was previously placed in the genus Poinciana, named for Phillippe de Longvilliers de Poincy, the 17th century governor of Saint Christopher (Saint Kitts). It is a non-nodulating legume. Gulmahor tree (Delonix regia) with flowers, Haridwar, India. Delonix regia var. flavida is a rarer, yellow-flowered variety. The flowers of Delonix regia are large, with four spreading scarlet or orange-red petals up to 8 cm long, and a fifth upright petal called the standard, which is slightly larger and spotted with yellow and white. They appear in corymbs along and at the ends of branches. The naturally occurring variety flavida (Bengali: Radhachura) has yellow flowers. The pods are green and flaccid when young and turn dark-brown and woody. They can be up to 60 cm long and 5 cm wide. The seeds are small, weighing around 0.4 g on average. The compound (doubly pinnate) leaves have a feathery appearance and are a characteristic light, bright green. Each leaf is 30–50 cm long with 20 to 40 pairs of primary leaflets or pinnae, each divided into 10–20 pairs of secondary leaflets or pinnules. Delonix regia is endemic to the Madagascar's dry deciduous forests but has been introduced into tropical and sub-tropical regions worldwide. In the wild it is endangered, but it is widely cultivated elsewhere. The royal poinciana requires a tropical or near-tropical climate, but can tolerate drought and salty conditions. It prefers an open, free-draining sandy or loamy soil enriched with organic matter. The tree does not like heavy or clay soils and flowers more profusely when kept slightly dry. In addition to its ornamental value, it is also a useful shade tree in tropical conditions, because it usually grows to a modest height (mostly 5 meters, but it can reach a maximum height of 12 meters) but spreads widely, and its dense foliage provides full shade. In areas with a marked dry season, it sheds its leaves during the drought, but in other areas it is virtually evergreen. In the continental United States, it grows in South Florida, Central Florida, and in the Rio Grande Valley of South Texas. It is much loved in the Caribbean and is featured in many Dominican & Puerto Rican paintings. It can also be found in Belize, The Bahamas, Cuba, Haiti, Hawaii, Mexico (especially in the Yucatan peninsula), Nicaragua, U.S. Virgin Islands, Guam, Canary Islands, Curaçao, the Commonwealth of the Northern Mariana Islands, where it is the official tree of the islands, and Israel. It is the national flower of St. Kitts and Nevis. In Mauritius and La Réunion it announces the coming of the new year. In the Philippines, its full bloom signals the imminent arrival of the monsoon rains. It is very widely grown in the Northern Australia (the southern extremes previously limited to South East Queensland, although it now grows and blooms successfully in Sydney with flowering trees identified in the suburbs of Petersham, Parramatta, Guildford, Warwick Farm and Kurmond), Hong Kong, Paraguay, Peru, Spain (southern coast of Spain) the Valencian coast and on all Canary Islands, Thailand, Philippines, Sri Lanka and southern China. It is the official tree in Vietnam, Tainan, Taiwan; Xiamen, Fujian Province, People's Republic of China; and Shantou, Canton Province, People's Republic of China. National Cheng Kung University, a university located in Tainan, put royal poinciana on its emblem. It also grows throughout southern Brazil, with ornamental trees in Rio Grande do Sul (Canoas and Porto Alegre). The royal poinciana is regarded as naturalised in many of the locations where it is grown. It is a popular street tree in the suburbs of Brisbane, Australia. The tree is also found in India, where it is referred to as the May-flower tree, Gulmohar or Gul Mohr. In West Bengal (India), Odisha (India), and Bangladesh it is called Krishnachura. The town of Peñuelas, Puerto Rico, located about 12 miles or 19 kilometers west of Ponce, is nicknamed "El Valle de los Flamboyanes" ("The Valley of the Poinciana Trees"), as many flamboyant trees are found along the surrounding Río Guayanes, Río Macana, and Río Tallaboa Rivers. The royal poinciana is most commonly propagated by seeds. Seeds are collected, soaked in warm water for at least 24 hours, and planted in warm, moist soil in a semi-shaded, sheltered position. In lieu of soaking, the seeds can also be 'nicked' or 'pinched' (with a small scissors or nail clipper) and planted immediately. These two methods allow moisture to penetrate the tough outer casing, stimulating germination. The seedlings grow rapidly and can reach 30 cm in a few weeks under ideal conditions. Less common, but just as effective, is propagation by semi-hardwood cuttings. Branches consisting of the current or last season's growth can be cut into 30 cm sections and planted in a moist potting mixture. This method is slower than seed propagation (cuttings take a few months to root) but is the preferred method for ensuring new trees are true to form. As such, cuttings are a particularly common method of propagation for the rarer yellow-flowering variety of the tree. In the Indian state of Kerala, royal poinciana is called kaalvarippoo (കാൽവരിപ്പൂവ്, kālvarippūv) which means "the flower of Calvary". There is a popular belief among Saint Thomas Christians of Kerala that when Jesus was crucified, there was a small royal poinciana tree nearby his Cross. It is believed that the blood of Jesus Christ was shed over the flowers of the tree and this is how the flowers of royal poinciana got a sharp red color. It is also known as Vaaga in many areas of Kerala. Flame Trees, the iconic ballad by Australian Rock music band Cold Chisel is said to have been inspired by a preponderance of poinciana trees, however this is incorrect. The Flame trees reference in the song applies to the native Australian Flame Tree (Brachychiton acerifolius). It is also the national flower of St. Kitts and Nevis. The song Poinciana was inspired by the presence of this tree in Cuba. ^ "Delonix regia (Hook.) Raf. — The Plant List". theplantlist.org. ^ a b Don Burke (1 November 2005). The complete Burke's backyard: the ultimate book of fact sheets. Murdoch Books. p. 269. ISBN 978-1-74045-739-2. Retrieved 9 March 2011. ^ Edward F. Gilman & Dennis G. Watson. "ENH387/ST228: Delonix regia: Royal Poinciana". ufl.edu. ^ "Is that a poinciana?". GardenDrum. ^ Cowen, D. V. (1984). Flowering Trees and Shrubs in India (Sixth ed.). Bombay: THACKER and Co. Ltd. p. 1. ^ Annamma Thomas; T. M. Thomas (1984). Kerala Immigrants in America: A Sociological Study of the St. Thomas Christians. Simons Printers. p. 34. Wikimedia Commons has media related to Delonix regia. Dressler, S.; Schmidt, M. & Zizka, G. (2014). "Delonix regia". African plants – a Photo Guide. Frankfurt/Main: Forschungsinstitut Senckenberg. This page was last edited on 14 March 2019, at 03:21 (UTC).